Vinitaly International Academy – the New Hope for the Italian Wine Market in China? On March 20, 2019, in Chengdu, four wine professionals based in China achieved the prestigious title of Vinitaly International Academy Italian Wine Ambassador, after a week of intensive lectures, tastings, and a rigorous examination on Italian wine. In Chengdu, Vinitaly International Academy trained 30 wine professionals to the highest level and offered them the unique opportunity to taste around 150 Italian wine labels locally. 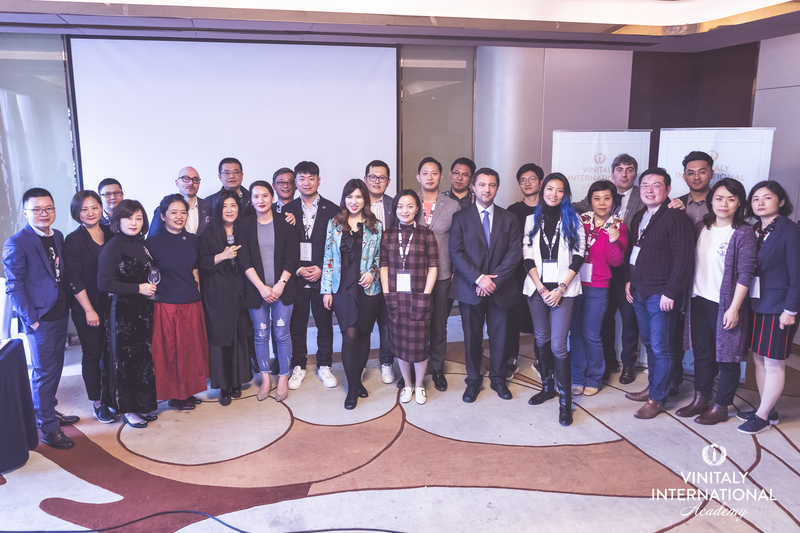 From March 16 to 20, 2019, the Vinitaly International Academy (VIA) returned to Chengdu for its reformatted Italian Wine Ambassador Certification Course. This was VIA’s second time in Sichuan’s capital. The 5 day in-depth course was held at the Xanadu Hotel, where 30 Chinese wine professionals delved deep into Italian native grapes and territories, under the guidance of VIA Faculty Sarah Heller MW and Henry Davar. Marisa Wu, General Manager at M&B Wine Co.
Guangshuai Zhang, General Manager at Pro Italy international trading Co., Ltd. The overall count for VIA-certified Italian Wine Experts and Ambassadors after the Chengdu course has now reached 181 professionals and of which 168 are Ambassadors and 13 Experts. Flavio Innocenzi, Commercial Director of Veronafiere, who opened the ceremony praised the entire class for the work they are doing in the market promoting Italian wines, and gave words of encouragement to those unsuccessful on this try, reminding them that being part of the community of passionate Italian wine lovers makes them ambassadors in their own right. A passion for wine education was a particular feature of the VIA Chengdu 2019 cohort with seven of the candidates certified wine educators, with a further 10 holding WSET Level 3 and three being WSET Diploma holders. In the 2018 academic year, the Wine and Spirits Education Trust (WSET) recorded an 11% increase in global candidates, with Chinese candidates numbering 21,986, a 9% increase on the previous year and the greatest single represented country. These figures confirm China as WSET’s strongest international market and an optimal market for a pioneering wine educational project such as Vinitaly International Academy. A particular appeal of higher level WSET courses is the variety of the wines tasted. VIA take this aspect to the next level. Students not only taste a vast number of wines, they also get to encounter extremely rare Italian grapes. An example of this intense tasting approach was seen in VIA Chengdu: during the week of classes and tasted labs students have tasted 35 single expressions of grape varieties, and thanks to the generosity of VIA Supporters—Famiglie del Vino, Italian Signature Wines Academy, Consorzio Vini del Trentino, Sicilia DOC and Italia del Vino—this edition has managed to show those such as Tintilia, Prié Blanc, Oseleta, Nosiola. This is a considerable achievement and of significance when educating about those grapes harder to find represented outside of Italy, giving greater context for the theoretical session. Overall, when including blends, students have tasted 45+ different grape varieties and around 150 wines. The next VIA Italian Wine Ambassador courses include: the flagship edition in Verona, Italy, in the lead-up to Vinitaly from March 29 to April 2; New York City from June 24 to 28 (registrations are open), as well as a number of additional locations in the United States and Asia soon to be announced. ABOUT: Vinitaly International Academy (VIA) aims to be the gold standard of Italian wine education. It offers a complete educational path with standardized courses that will teach professionals and educators to master the diversity of Italian wine in a rigorous, organized manner. VIA’s main objective is to foster a global network of highly qualified professionals such as Italian Wine Ambassadors and Italian Wine Experts: in turn, they will support and promote Italian wine throughout the world. VIA was founded by Stevie Kim, Managing Director of Vinitaly International. The new VIA ecosystem avails of the guidance of Italian trade associations Federdoc, Federvini, Vignaioli Indipendenti FIVI, and Unione Italiana Vini as members of the Institutional Advisory Board. Italian vine genetics scholar, Prof. Attilio Scienza, oversees VIA’s scientific and educational direction as the Chief Scientist. VIA Faculty Sarah Heller MW and Henry Davar teach the flagship Italian Wine Ambassador course. The following trade associations in the Italian wine industry have also joined as VIA Supporters: Italian Signature Wines Academy; Italia del Vino; Consorzio di Tutela Vini del Trentino; Consorzio di Tutela Sicilia DOC; Franciacorta, Le Famiglie del Vino; Consorzio di Tutela Vini d’Abruzzo. To date the VIA community comprises 168 certified Italian Wine Ambassadors and 13 Italian Wine Experts. Since its foundation in 2014, over 500 candidates from all over the world have taken VIA’s courses.